Deputy Attorney General, Rod Rosenstein sits in his office in the U.S. Department of Justice on July 20, 2017. WASHINGTON — Questions swirled around Deputy U.S. Attorney General Rod Rosenstein on Monday amid widespread reports that he might be out of his job at the Department of Justice, potentially eliminating a critical official who has supported the special counsel probe into Russian interference in the 2016 election. Three days after news emerged that Rosenstein once discussed secretly recording President Trump in a bid to remove him from office, a barrage of conflicting reports said he would resign or be fired, and cameras were aimed on the White House as Rosenstein arrived there Monday morning. By early afternoon, however, both predictions proved premature, if not wrong. At 1 p.m., the White House announced Rosenstein and President Trump would meet later this week. In a statement, press secretary Sarah Huckabee Sanders said the president and Rosenstein "had an extended conversation to discuss the recent news stories" but that "because the president is at the United Nations General Assembly and has a full schedule with leaders from around the world, they will meet on Thursday when the president returns to Washington." While the announcement deflated the frenzied speculation building in Washington, it unleashed a new round of anticipation that Thursday — the same day a Senate committee will hear sexual assault accusations against Trump Supreme Court nominee Brett Kavanaugh — could portend a momentous day in Washington, and the country. Firing Rosenstein, who as acting attorney general in 2017 appointed Special Counsel Robert S. Mueller, would heighten concern about the possibility of Trump's trying to strong-arm — if not shut down — the investigation that has shadowed his presidency and reached into his inner circle, and that he has denounced as "a witch hunt" and "hoax" whipped up by Democrats. Trump has reportedly sought to derail the Mueller probe, and that could intensify if Rosenstein is replaced with a closer ally of the president. Rosenstein's position grew even more precarious after Friday's report by the New York Times that he had discussed secretly recording the president and invoking the 25th Amendment as a way to remove Trump from office after the president fired FBI Director James Comey. The news of Rosenstein's potential departure sent shock waves through the Capitol, just weeks before midterm elections already seen as a national referendum on Trump's first two years in office. U.S. Rep. Adam Schiff (D., Calif.), the top Democrat on the House Intelligence Committee, tweeted that Rosenstein "should continue to do his job, protect the independence of the DOJ, and if the President intends to obstruct justice, force Trump to fire him." Some of Rosenstein's former colleagues puzzled over the reports of a resignation. Megan Brown, who worked for Rosenstein in the early 2000s when he was a federal prosecutor in Maryland, found it difficult to imagine that Rosenstein would resign, given that he'd already survived so many months of tumult. "Whatever the truth ends up being — and I'm quite skeptical, given the media's track record with most things related to Rod — I'm confident that he's doing the right thing for the country and himself," Brown said. Democrats and some Republicans have said for months that the rule of law is under threat by Trump, and Rosenstein's ouster would heighten those warnings. Trump and his allies have painted the Justice Department as an out-of-control agency seeking to undermine him. If Rosenstein resigns or is fired, Noel Francisco, the solicitor general, would assume oversight of the Russia investigation, according to the New York Times. Over the course of a nearly three-decade career in federal law enforcement, Rosenstein has developed a reputation as a straight arrow who didn't allow personal politics — he's a Republican — to influence his day job. 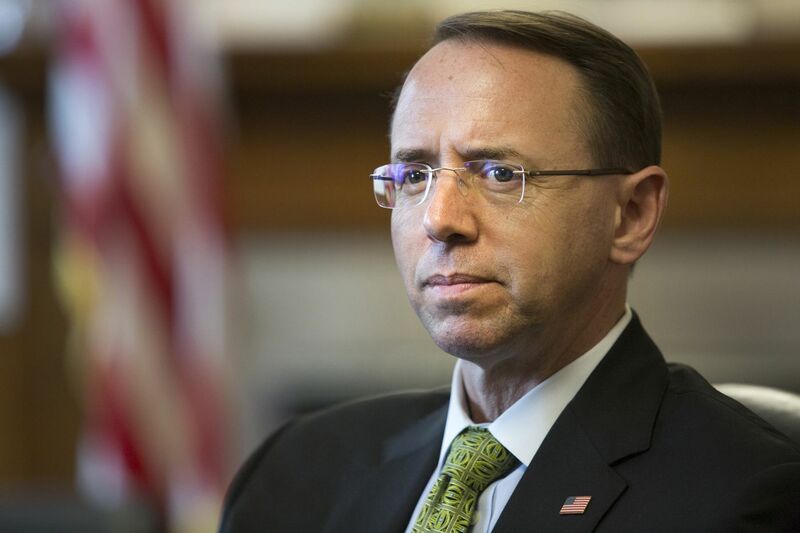 Born in Philadelphia and raised in Montgomery County, Rosenstein began working at the Department of Justice in 1990 and got his first taste of a megawatt political scandal in 1995, when he worked on the Kenneth Starr-led Whitewater investigation into murky Arkansas real estate deals that involved Bill and Hillary Clinton and a number of their associates. In 2005, President George W. Bush appointed Rosenstein as U.S. attorney for the District of Maryland. He stayed in that position throughout President Barack Obama's tenure, an accomplishment that Rosenstein's supporters cited as proof of his apolitical nature. During an interview in 2017, Rosenstein shied away from responding to President Trump's ongoing criticism of the Mueller investigation. "Some people might say, 'Well, we should respond every time there's a criticism, because we need to get our position on the record,' " Rosenstein said. "But that's actually not the way that I see it. I think the public's respect for the Department of Justice is in part a product of people understanding that we do not react to every immediate development in the media." Rosenstein's last public appearance in Philadelphia was in June, when he spoke at a Society Hill alumni dinner for Central High School, which counted his father as an alumnus. Rosenstein didn't mention Trump or the Mueller probe then, either — but he did speak about Rocky Balboa. Life isn't about how hard you can hit, Rosenstein said, paraphrasing Rocky, it's about how hard you can get hit and keep moving forward.